Added option 'Esc keypress in main window' (in 'Tools' → 'Options' → tab 'Interface'), which allows to specify the action of the Esc key (ignore, lock workspace, minimize, minimize to tray, exit). Added option 'Ignore search settings of groups' in the 'Find' dialog. Internal data viewer: added support for zooming images using the OEM + and - keys with Ctrl. Added accelerator keys (especially for labels) in various dialogs. Added UIFlags bit for disabling the 'Database Settings' menu item. Added workarounds for Windows RTF character encoding bug. Added workaround for Mono input focus restoration problem that occurs when a form gets activated. Plugins: added method to provide menu items. Plugins: added property to get the edit mode of an entry dialog. TrlUtil: added tab 'Validation', which shows the results of all checks that TrlUtil performs. TrlUtil: the tab in the preview form that contains the currently selected control is now selected automatically. TrlUtil: the preview form now shows accelerator keys permanently. TrlUtil: enhanced support for derived control classes. TrlUtil: the current file name is now displayed in the title bar. Enhanced installer (added user directory checks, added option to open the plugins web page, component/option names can be translated now, updated NGen size estimation, improved file associations update, ...). In order to avoid selection/Ctrl+A problems, the user name auto-completion now does not append suggestions anymore; it only shows a list of suggestions (in which a suggestion can be selected manually). Improved accelerator keys in the 'Find' dialog. The history list in the entry dialog now supports showing custom icons. Mass entry modifications (colors/icons) now create history entries, if necessary. Improved text rendering in dialog banners. In the database settings dialog, the path of the database file is now shown in the dialog banner. Improved selection/view preservation of the entry view. While importing/synchronizing, a status dialog is displayed now if and only if the main window is not constructed completely yet (otherwise the status is displayed in the main window). Improved reliability of clipboard operations. Improved error reporting for the 'Paste Entries' command. Renamed the automatic clipboard clearing option and added a tooltip in order to clarify the behavior of the option. The commands 'Find Similar Passwords (Pairs)', 'Find Similar Passwords (Clusters)' and 'Password Quality Report' now ignore TAN entries. The report of clusters of similar passwords now shows more clusters in certain cases. In the 'Plugins' dialog, the plugins are now sorted alphabetically. KeePass does not try to load satellite assemblies as plugins anymore. Improved configuration saving when an enforced configuration file exists, but no global one. Improved reading of KDBX XML documents with unknown elements. The export module 'Customizable HTML File' now works fine on Unix-like systems, too. On Unix-like systems: improved support for executing KeePass while no X server is running. ShInstUtil: improved NGen detection on 64-bit systems. TrlUtil: the preview form does not steal the input focus anymore. TrlUtil: improved accelerator key check. Fixed a bug that caused KeePass to crash when trying to view certain password generator profiles. The option 'Use monospace font for passwords' in the 'Print' / HTML export dialog now works for all translations. Enhanced installer (added user directory checks, the plugins web page option can be translated now, ...). The data for the 'Clipboard Viewer Ignore' clipboard format is now stored in UTF-16 on Windows 2000 and higher. Moved the option 'Clear clipboard when closing/locking the database' from the 'Advanced' tab to the 'Memory' tab. Upgraded to Boost libraries version 1.69.0. Added automatic completion support for the user name box in the entry editing dialog and the auto-type sequence boxes in the entry/group editing dialogs (suggesting user names and auto-type sequences that are used in other entries/groups). Added automatic completion support for the URL and user name boxes in the 'Open From URL' dialog (suggesting URLs and user names of items in the list of most recently used database files). Added option 'Group path' in the 'Find' dialog (enabled by default for quick searches). Added read-only mode for the entry string dialog, which is used by the entry dialog when viewing a history entry. The internal data viewer now supports zooming images using Ctrl+Add, Ctrl+Subtract and the mouse wheel with Ctrl; furthermore, there are now '+' and '-' buttons right of the zoom selection box in the toolbar. Added option 'Remember master password (in encrypted form) of a database while it is open' (which is the default; turning off this option prevents the usage of certain features). The 'Configure Columns' dialog now computes a display order for the new columns, taking the previous display order into account. While importing/synchronizing, no status dialog is displayed anymore (the status is displayed in the main window). Improved UI responsiveness during long operations. When hiding/restoring the main window via the system tray icon fails, KeePass now shows a notification. Improved Return key handling in text boxes. Improved initial input focus in some dialogs. Enhanced database file path unification. 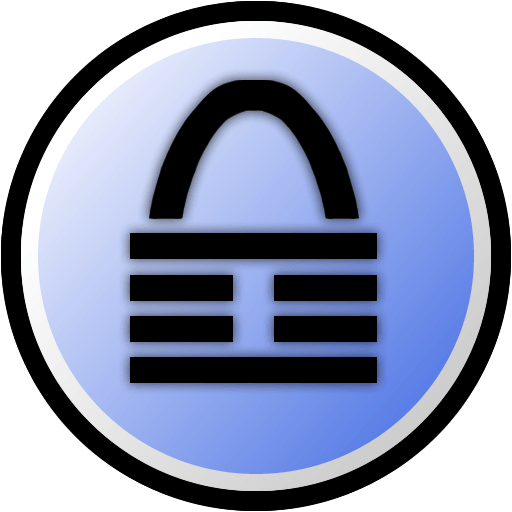 The configuration system does not create a KeePass folder in the user's application data folder anymore when the target configuration file location is outside this folder. Improved window text query method. Various improvements for right-to-left writing systems. Improved support for case-sensitive command line parameter names (for plugins and KPScript). If a plugin is available both as a DLL and as a PLGX (in the same folder), KeePass now loads either the DLL or the PLGX. For plugins: most public definitions are now static. KPScript: improved parsing of escape sequences. Renamed native support library item in the installer.